The bottom line is that you don't put up signs in your restaurant that say "This is America. 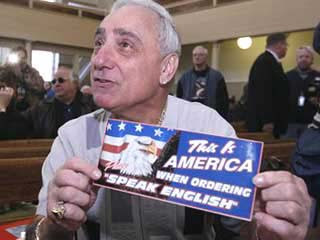 When Ordering Speak English" unless you're some xenophobic cave dweller. Really. It just doesn't happen. The owner of Geno's Steaks, Joe Vento, even admits that he put up the signs "because of concerns over the debate on immigration reform" - and a commision found probable cause against Vento for discrimination because his "policy" does in fact try to intimidate against certain people of ethnic and racial backgrounds. I've never - ever - come across someone who, when English isn't their first language, just steps up into a place and starts speaking in their first language when ordering or buying something, unless they know someone at the store speaks that same language. What people really have a problem with is when a person comes into their establishment and orders in English - but they have a thicker accent, or since they may be new to the language may rearrange some words grammatically. The last time I checked though - that's speaking English. But people like Joe don't really have a problem with people who are learning the language - that's just their excuse - they just don't like certain non-white people who are learning the language - because you know if a white Russian Victoria's Secret model came into Geno's with a thick accent trying to order a foot long - Joe Vento would be all over that, and would be welcoming all the "non-english speaking" people he could find into his restaurant, regardless of if it took them a little extra time to order.